Last month the nice people over at Tmart contacted me and offered me the opportunity to review one of their products. Selecting which one was a difficult choice since they have hundreds of cool items at their site. I eventually decided on their electric heating lunch box since I don't have one of these. I decided to pack a work lunch for myself and gave this lunch box a try. I wanted to experience for myself just how warm this would keep the food. I packed leftover barbeque chicken, rice with salmon furikake, blanched broccoli from my refrigerator directly into the electric heating lunch box. As soon as I arrived at work, I plugged it in and had lunch five hours later to find my food hot! I have to say that I am quite impressed. This lunch box will be great anytime especially during winter months when hot chilli, soup, pasta and more is just what you want. This portable electric lunch box is lightweight, durable and made of non toxic material. It stores and recycles heat within the container keeping the foods wonderfully hot and it is equipped with a steam release cover. It has a divider and a removable compartment with it's own separate cover. The lid is secured with four sided locks which keeps heat within the box. The lid itself has a section with its own hinged cover which carries a spoon and there is also an easy carry handle. T.mart store sells electronics, computer accessories, games, toys, holiday supplies, gifts and more. Visit their store HERE and check them out. Their prices are quite reasonable and they also offer worldwide free shipping!! T.mart is generously offering the same electric heating lunch box to one of my readers. To enter, it is mandatory that you visit T.mart, check out their many awesome products, and leave a comment on this post telling me what items you like most at their site. Click the I Commented button in the Rafflecopter widget below after leaving your comment. Great giveaway and I hope to win the lunchbox for myself! I like their violins at their site. What a great giveaway! I work out of my car and would love to be able to bring a hot lunch. Thank you for the opportunity to win. Such a wonderful giveaway! They have so many unique products.I would like to win the electric heating lunch box. Love the pendants, I make baskets and little touches like these help to make them personal. The novelties are fun to look at, gecko bracelet looks like it will become a Christmas present. And best of all tmart offers free shipping. Thank you for sharing. 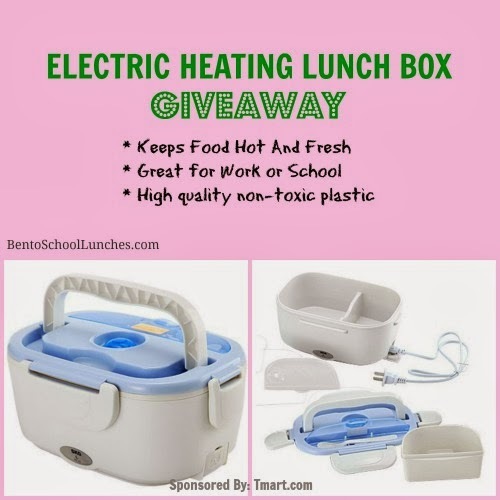 I would like to win the electric heating lunch box!!!! i want a lunchbox for each member of my family! how cool! I've had my eye on this box for so long! Tmart has some great items! I like that they carry bento goodies too! I like all the tablet PCs since I'm in the market for one. They're not that expensive like this one: 7" Capacitive Touch Screen Android 4.0 4GB Tablet PC and they're having Black Friday sales already! Yikes. I would love a chance to win the heated lunch box. I also like the nintendo WII motion plus! that's a very good price! Wow, electric lunch box! For the website, the earrings section looks really interesting. I like the Tablet PCs there! I just got a freezer (which I haven't had for two years), so the possibility to make ice at all is an awesome feeling to me, haha. Cool giveaway n great review. Interesting pdts they hv, I would love to win this electric lunchbox. I like this electric heating lunch box, but I also found a Japanese style two tiered lunch box on their site that I like as well. Decisions decisions. I love the suction cup iphone holder. How convenient! I really like the Wig section. They have a large collection of very cool wigs and hair extensions. I like all the little gadgets. Awesome! It's what I was looking for! I like the led head lamp for camping. I like the Colorful stars laser projector. They have so many great items, it's hard to choose, but I really like the Garment Storage Portable Wardrobe Organizer Closet Rack. thank you. i love the Universal Tablet PC Car Backrest Mount Holder for iPad but honestly the heated lunch kit is totally awesome, my husband drives a bus and has no where to warm meals. I love their speakers and headphones section. 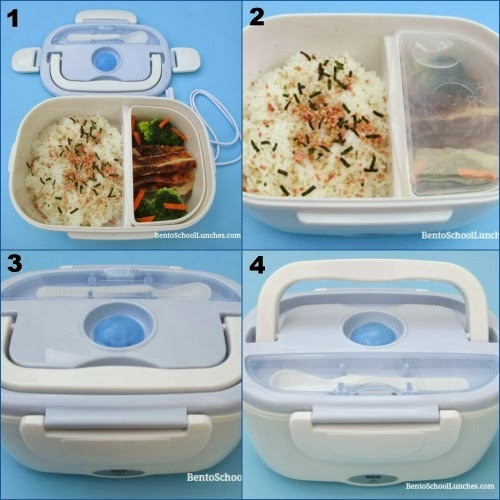 But nevertheless, this lunch box would make my life so much easier! Obviously, coming from a lunch box giveaway, the first things I looked up on T.Mart were other lunch items, and I really like the sandwich shaper. I like the Simple Double Row Double Door 7 Layers 12 Lattices Non Woven Shoe Rack and the 17 X 11 X 3 inches Soft Baby Health Care Cotton Pillow White. Thanks for the great giveaway opportunity. Keep up the terrific blogging. I like the cooler pad http://www.tmart.com/R18-USB-Cooling-Cooler-Pad-for-the-Following-17-Laptop-PC-Black_p150708.html Would be sooo handy! i love the hamburger bento with the spoon fork kit. Their tablets look really nice on their site. I like the car dvd players!! I love their double tier lunch box. the front-loading rifle scope looks pretty cool (if only I could own one here :P) guess I'll have to settle for the electric heating lunch box.awesomely useful. I love the Bags, all the apperal stuff are awseome! Oh my there are so many products I love at Tmart. One thing I really left is the solar powered toys especially the diy solar kits for kids. My husband would love this lunch box thank you! I like the D202 High Power 1W LED Lithium Battery Chargeable Headlamp for Hunting Purple. I love their selection of pet beds, especially the heating pad ones and the rattan ones for cooling in the summer. I'm a bit of a techie, so their computer tablets are fantastic and so cheap! They have such a wide selection. I really like the charming peach heart bangle bracelet the most! I love this high tech way of keeping food hot. very neat! This lunch box is so cool! On their site the 3W CREE Q5 Waterproof LED Outdoor Camping Light Blue caught my eye. I like the hamburger lunch box! I want that lunch box for my son! I also really want the corn light bulbs, the battery charger and rechargeable batteries. I like the Metal and Plastic Water-saving Shower Head Spray. I love the tablet PCs ! I like the n135 5 Fans Laptop Cooling Pad. I'd love to have one for my laptop. I really like the Creative Five-Colored Flower Pattern Anti-Electric Shock Power Socket Outlet Plug. I like the Multifunctional Electronic Knife-grinder Knife Sharpener White. The cosmos laser projector is pretty awesome. I like the 7" Capacitive Screen Android 4.0 4GB Tablet PC with Camera Wifi HDMI TF Blue. There are so many to choose from!! I like that they have cell phone accessories. I like the Colourful Stars Cosmos Laser Projector. I like the Bakelite Head Portrait Bent Smoking Pipe. My dad smokes a pipe and would love it!